Our unique Space Camp Combo with slide is sure to please any child! Your boy or girl will love this space design where he/she can imagine and play astronaut! 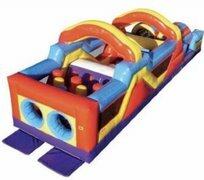 With a bounce area, tunnel, climb, and slide, this unit will keep your kiddos busy for hours! Our unique Princess Club Combo with slide is sure to please any girl! Your girl will love this princess design where she can imagine that she's in a beautiful princess palace! 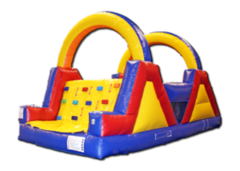 With a bounce area, tunnel, climb, and slide, this unit will keep your kiddos busy for hours! Our unique Atlantis Camp Combo with slide is sure to please any child! Your boy or girl will love this space design where he/she can imagine they are underwater! With a bounce area, tunnel, climb, and slide, this unit will keep your kiddos busy for hours! This sweet Ice Castle combo unit combines a bounce house and climb and slide! 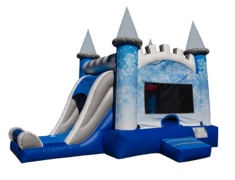 Perfect for any Frozen themed birthday party - your little Olaf, Kristoff, Elsa or Anna will love bouncing in this unique 21'x13' gender neutral unit. It even includes a basketball hoop in the bounce area (ball not included). 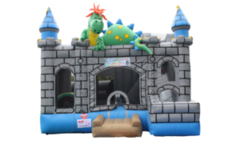 This bounce house combo is the perfect backyard addition to any event! Our fun sports combo bouncer features a large bounce area along with a slide. 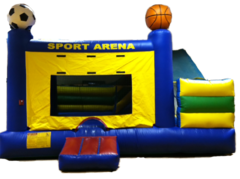 This unit is great for anyone have a sports themed event. With a bounce area, tunnel, climb, and slide, this unit will keep your kiddos busy for hours! 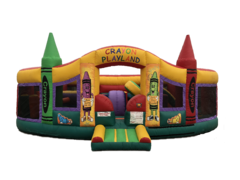 Crayon Playland is an obstacle course designed for the smaller kids of the group, but it's still a good sized unit at 18L x 26W x 10H. This obstacle has plenty of fun inside with a small slide and obstacles to keep the kids busy for hours. This unit has a 100 pound weight limit per child, so it's for the littler one's who aren't quite ready for our bigger obstacle courses. This fun interactive ring can be used for jousting tournements or as a boxing ring. This unit is fun for all ages, but still has a 200 pound weight limit per person. This unit is fun for any party or any school/church event. The boxing gloves are oversized to ensure no one gets hurt. The velcro wall can be fun for all ages!! The velcro wall comes with two kid suits and two bigger adult sized suits. The weight limit is around 200 pounds per person. Looking for something with more to do? Our 5-in-1 Medieval Dragon Combo has just the stuff! With a space for jumping, an obstacle area, climb, dry slide and basketball hoop (small ball not included), this will keep your kiddos busy for hours! The awesome design will make this the talk of your guests! Looking for something to make a huge hit at your next party. The monster truck will definitely be the talk of the party. It stands 33 ft long, by 13 ft wide and is just over 18 ft tall. It has a giant bounce area and a climbing wall which leads to a slide. This is easly one of the most unique and cool bounce combos out today. This is the ultimate in party fun! Kids of all ages love this interactive unit. Designed to run two people at a time, this unit is ideal for races! Kids will climb up the small rock wall, climb through vertical and horizontal pillars, and come out at the end through two tunnels. At 24' long, this unit is perfect for backyard parties! Looking for a bigger challenge? This is it! Combine our obstacles 1 and 2 for a 48' long thrill! Start with the smaller rock wall, dive through upright pillars, under a horizontal beam, through the tunnels and out through some more upright pillars. Hit the big rockwall and slide down the slide and race to the end! Designed for two people at a time. You will need two electrical outlets on different circuits as this unit requires two blowers, and three attendants are required to supervise to ensure safety of the participants. The obstacle fun run is a fun obstacle for all ages. It's challenging but doesn't have the steep wall like our obstacle 4. Kids will have racing each other to the finish to see who wins!!! You will need two electrical outlets on different circuits as this unit requires two blowers, and two attendants to ensure the safety of all kids. Kids of all ages love this interactive unit. Designed to run two people at a time, this unit is ideal for races! Kids will tunnel through vertical pillars before squeezing through horizontal pillars, another tunnel and more vertical pillars. Then they'll climb the huge rockwall and slide down the 11' two-lane slide and exit under the arch at the end. 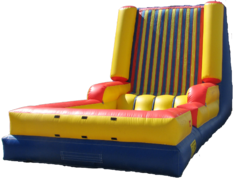 At 20' tall and 60' long, this unit is great for corporate events, or church and school festivals or parties, and will keep kiddos busy for hours! If you will be using this unit for residential parties, please ensure you have at least 70' of length available without obstructions. This unit requires two electrical outlets on two different circuits, and will require two attendants for safety.